With all the thinking, planning, dreaming, envisioning, drafting, creating, and strategizing you're doing each day, give your mind the gift of space. The 8 sections in this Multi Step File Organizer are designed to give you easy access to all your files and folders, in a roomy organizer that feels at home in your office space - or any space. Finally, your important documents, papers, folders, and files, that have been piling up on surfaces large and small, have a smartly sectioned space to call their own. Got stuff? Get rid of the clutter and expand your mindspace. ▶ ENOUGH SPACE FOR EVERYTHING. The eight sections in this wire step file organizer will keep the stuff you need at hand, while staying out of your way. ▶ MORE SECTIONS FOR BETTER SORTING. Built with your efficiency in mind; use the 8 sections to sort your files and folders to increase efficiency and productivity. ▶ THE LIGHTWEIGHT HEAVYWEIGHT. 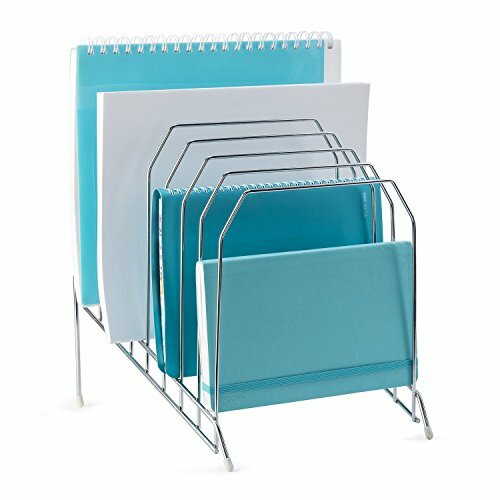 Made of lightweight steel wire construction, this organizer will keep your files and folders at hand while being none the worse for wear. ▶ LOOKS GREAT ON YOUR DESK. A gleaming metal finish looks great and feels good to the touch, while 4 rubber foot grips protect your desk from scratching.